Previews of various 5 reel multi payline slots. They have over 200 of the best online casino games including Keno Video Poker, Blackjack and all of the very latest Bonus Feature Slots including Chocolate Factory. Dolphin Tale Slot is an exciting slot which offers Free Spins at different multipliers depending on which sea creature you choose when your bonus round begins. 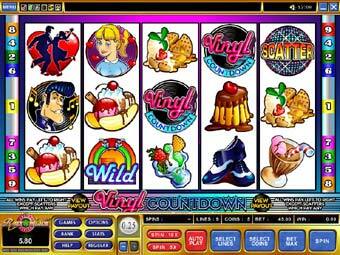 Vinyl Countdown is a new 5-reel, 9 payline video slot that is bound to strike a chord with the rock 'n roll generation of the 50's and 60's. With its fun retro-theme, catchy tunes, great sound and bright and breezy graphics, rock 'n roll enthusiasts will love this game. 5 Reel Drive has a wild symbol, the Winding Road Sign, as well as a scatter symbol, the Police Car. For every coin that you put in, you enable another payline The game 5 Reel Drive is a five-reel, nine payline slot machine. 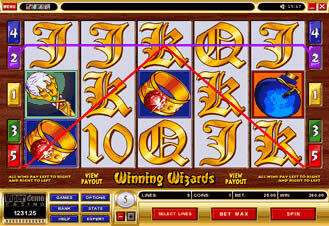 Winning Wizards is an enjoyable colourful slot machine. It has 5 reels and 5 pay-lines. 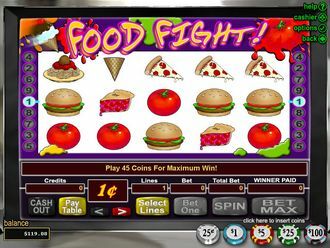 This is a very entertaining slot machine to play, with 29 winning combinations that pay from right to left and from left to right there are many ways to hit a winning combo. Hit the Bonus Round when you complete an Ice Cream Sundae. Hit a Cone, Ice Cream, and some Toppings for a big bonus win. For the Super Bonus Round, just hit a Pie Plate, Pie Filling, and a Cherry, and you get to start the Food Fight by throwing some pies. Win cash for each face you splatter with pie. The more you hit, the more you win! 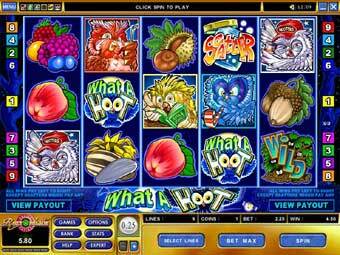 What a Hoot will have you hooting with laughter and excitement. Among the fruit and nut symbols make sure you look out for the party-animal Owls who are all looking to have a good time and party the night away. The platform is a 5 reel, 9 line, 1 coin game, with a Wild and a Scatter symbol to rev up the action with a medium to high hit rate. 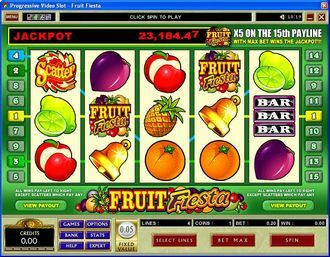 The 3 reel Fruit Fiesta slot that was among the first progressives on the Internet several years back has an updated and more substantial companion – Fruit Fiesta Progressive Video Slot. 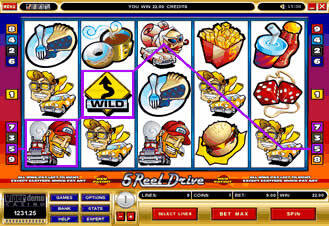 The new game features fresh and brilliant graphics and high speed, feature-rich action on a 5 reel, 15 line platform with wild and scatter symbols that will appeal to a wide range of online gamblers.